Could the bank we trust to safeguard our money now be one of the riskiest places to put it? It's no secret that major U.S. banks today are a prime target of both cybercrime and cyberterrorism. Not even America's top secret intelligence agencies, such as the CIA and NSA, are safe from hackers or leakers. Your bank deposits, online stock and retirement accounts are presently in danger in at least 20 major ways - which are detailed in an urgent Special Report. 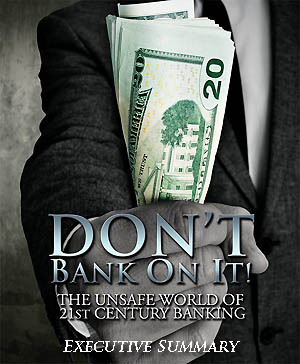 Author and monetary expert Craig R. Smith and futurist Lowell Ponte explain how and why trusting your money to today's unsafe banks is illogical and hazardous to your wealth. The risks are now on every side - from cybercriminals, money-hungry politicians, Too-Big-To-Fail bankers, and "Financial Repression" - which secretly steals the buying power from your hard-earned savings. Discover a simple, time-tested technique to protect your savings and retirement funds from theft and devaluation today! Call 800-289-2646 or register for this complimentary DON'T BANK ON IT! Special Report! SWISS AMERICA and Logo are trademarks of Swiss America Trading Corp.